Oh so you want a creamy, dairy free soup that’s packed with bold flavors? There’s a recipe for that. And I have it right here. Creamy. Tasty. 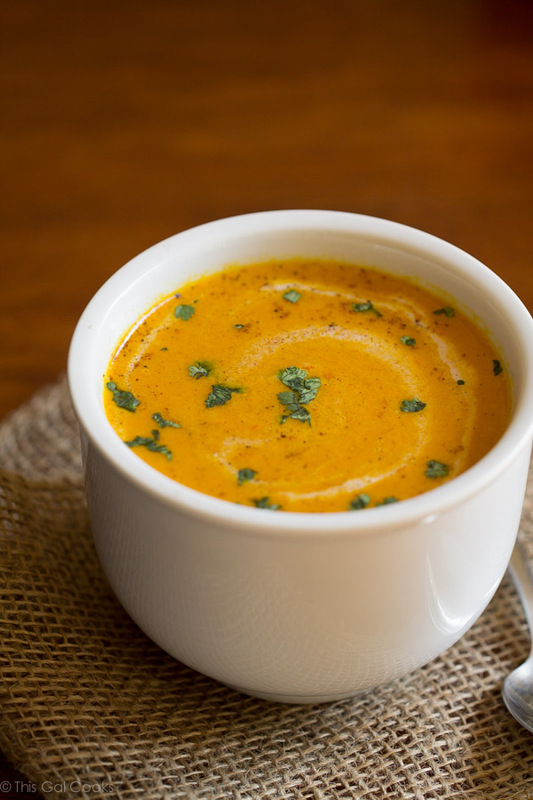 Moroccan Carrot Soup. This month I got to explore the delightfully tasty Della Cucina Povera. I’m so happy that I was assigned Francesca’s blog because, well, I want to eat all of the food! She shares healthier, made from scratch recipes that will make you swoon. I want to make all of them but settled on the tasty carrot soup for now. I made a few changes to the original recipe, the main one being that I cut back on the chicken broth and added coconut milk to give the soup a creamier texture and a richer flavor. Lactose and I aren’t the best of friends so I said no-no to heavy cream and half and half. I also added a little ground ginger and turmeric to the mix since they are two spices that I am quite fond of. Overall I’m quite happy with this soup. It was a tad bit gritty but I blame my cheap $20 blender on that. One day, oh one day a Vitamix or BlendTech blender shall be mine. A gal can dream, right? Or decide to part ways with $400 so she can have the fancy blender of her dreams. Heat the olive oil in a large dutch oven. Add the onions, garlic, red pepper and carrot. Cook until tender, about 5 minutes. Add the spices and enough of the broth to cover the vegetable mixture. Bring to a boil and cook 3-5 minutes. Remove the mixture from the pot and place in a blender. Puree until smooth. Return to the pot and add the remaining broth, coconut milk and the honey. Reduce heat and simmer for 20-30 minutes. Add salt to taste. Make it vegan: replace the chicken stock with vegetable stock and the honey with agave nectar. I would absolutely love some of your soup. It’s so eye-catching too. This looks so good! I have a Morrocon carrot salad that I LOVE, so I bet I would adore this soup! These photos are beautiful and I have been playing with darker moody shots too. 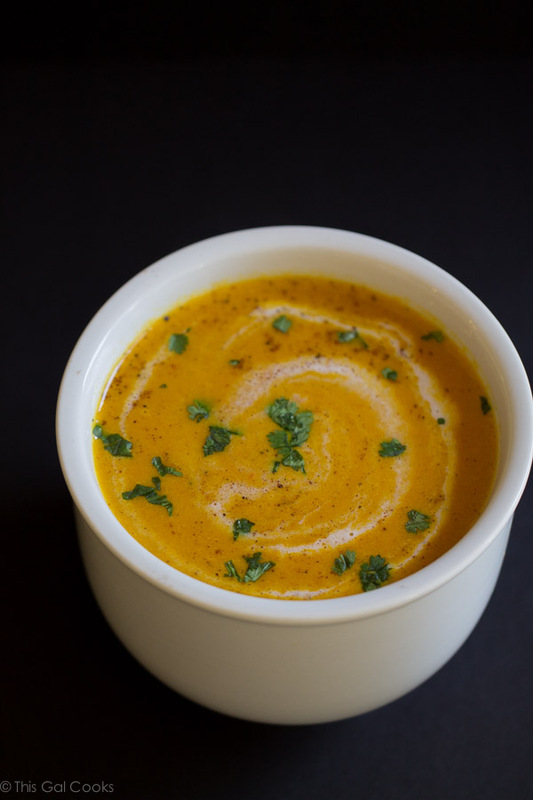 I love the idea of adding Moroccan spices and seasonings to carrot soup and cannot wait to make this for my family! Well, your moody shot puts me in the mood for this soup – you did a fantastic job with the recipe and pictures! Looks like you belong to a fun group too! This looks and sounds absolutely delicious, Julie! Pinned! Gosh, these are such beautiful pictures, Julie! And the soup looks really delicious. I could go for a bowl of healthy carrot soup. And I love anything with turmeric, it is one of my favorite spices! Yum! Welcome to the club Julie :) I love this recipe, now if only it wasn’t 80 degrees today! Refreshing, both the soup and the photography..
High five and hugs from Holland. I love carrot soup (especially your addition of coconut milk). Bookmarked for next time! Yummm!! The spices in this soup sound amazing. So warming and welcoming. I would love a big bowl of this!! Love your soup! I will have to send links your way for Vitamix giveaways, you’d love one. I got one using (all of) our credit card award points. I use it all of the time, especially for soups. This soup looks delicious, I love how you used coconut instead of heavy cream. Lactose and I aren’t good friends either so it’s perfect for me! Your pictures are gorgeous, including the moody one ;) Pinned! Thank you, Kelly! I big fluffy heart coconut milk! So pretty! I feel like carrot soup is something that can be eaten all year round which I love. Great pictures and a lovely soup, thanks for sharing! Julie, this soup seriously sounds amazing. I am a HUGE fan of carrot soup! Love the changes you made with adding in coconut milk to make it more creamy. Can’t wait to give this one a shot. Pinned. Hi Julie – what a gorgeous post, photographs, recipe and blog! You definitely captured the mood of that wonderful looking soup! Just beautiful! This soup looks fabulous. I love the seasonings used in this soup…it has to be delicious tasting. Thanks for sharing, and you certainly do cook from everything I’ve seen! Julie, this soup looks beautiful – the color is amazing and the flavors sound so great! Thanks so much for sharing and pinned! Hope you have a happy Saturday and a wonderful weekend! There are some beautiful flavours in this! I think carrots are possibly a bit underrated. They’re so cheap, last ages and are lovely roasted … and in wonderful soups like this! 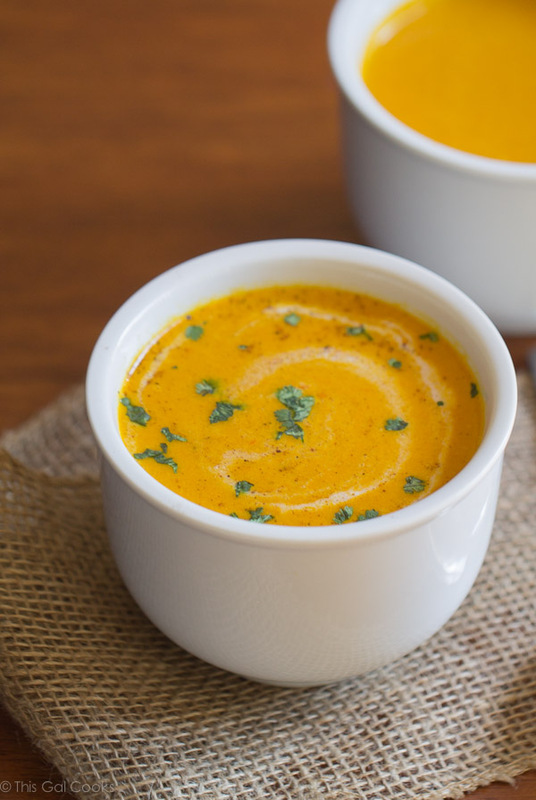 Love the combination of coconut milk, carrots and all of those wonderful spices! I love some texture in my creamy soups so the lack of high end blender works for me here. Beautiful shots. I love carrot soup. So I have tried several. But none that I actually kept the recipe. Coconut milk does make a difference in any soup as far as I concerned. Maybe this will be the carrot soup recipe I will end up keeping. Very nice selection of spices. I have this simmering right now……. Awesome! I hope you enjoy it, Jaci! No way did this make enough for 6 servings. I doubled the chicken broth, and I’ll have to change the spices when it’s done. I have a “fancy” stick blender, and it’s still gritty. We’ll see how it turns out. I love carrot soup! I’m going to try it again and blend it in my Ninja blender. I got one since I made this soup and let me tell ya, it pulverizes anything I put in it! I haven’t had a gritty smoothie yet so I’m hoping it can smooth out the carrots. :) Thanks for stopping by and I hope you enjoy it! Hi! I love that you added turmeric to the soup, but did you know that if you use ground black pepper along with it that it increases the bioavailability of the beneficial compounds in turmeric by 2000%? True story!! Also, my soup did not turn out gritty at all. From reading the comments and the directions, I think that the culprit may be blending it too early. I let my soup cook for 1/2 hour before blending it, and my little immersion blender is not fancy by any stretch of the imagination! Thanks for the tips, Leila! Will be sure to try next time I make this soup! Made this soup a few days ago with a few tweaks based on what was on hand and how lazy I can be at times with cooking – the biggest being I omitted coconut milk as I didn’t have any, and actually made this in the slow cooker, just threw everything in for 4 hrs on high and then blended. It sat for a few days in my fridge before I got around to enjoying it and in that time the flavours mingled amazingly together. I enjoyed it with a touch of fresh lemon juice and a side of fresh bread for lunch. Thanks for the keeper! I’ve made this soup twice in the last 2 weeks and it is amazing and so simple! I love the flavors, so I doubled the turmeric and ginger, and I added some crushed red pepper for some heat. The second batch turned out perfect to my taste. This will definitely be a staple all winter! I’m so happy you enjoy the soup recipe. Thank you for leaving a comment to let me know. I appreciate it. Is 2 tbsp coriander correct? Yes but you can cut back on the coriander to suit your taste.